Qatar secured the rights to host the 2022 football World Cup in 2010 amid allegations of bribing FIFA officials. It has since embarked on a $200 billion infrastructure-building spree—including stadiums, roads, hotels, a new metro system for Doha and the planned city of Lusail. This has brought greater international scrutiny of its labour standards. 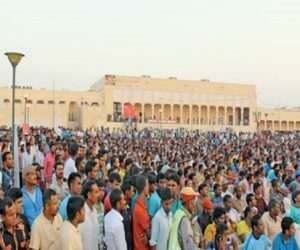 In 2014, based on figures provided by the Indian and Nepali embassies, the International Trade Union Confederation estimated that 1,200 workers had died since Qatar was awarded the World Cup in 2010, and that 4,000 more would die before the tournament. There have been reports of long hours spent working outdoors in extreme temperatures for low pay, as well as of the confiscation of passports and abuse of travel rights by employers. In response, Qatar claims to have radically altered its labour laws and has invited the International Labour Organisation to oversee its improvements. Ansari reached Qatar ten years ago. One morning soon after he arrived, he found another worker lying dead on a bunk bed. “I was trying to wake him up for breakfast, but he didn’t wake up.” The father of five did not inquire further, fearing that asking too many questions would jeopardise his position. He stuck with the same company, Redco International, which still pays him only $220 a month, just $15 more than the minimum wage established in 2017. He works three hours overtime to earn four extra dollars every day. Despite his meagre salary, Ansari managed to build a house back home, next to his father’s wooden hut. He also sent his son, born after four daughters, to a private school. He felt trapped in the middle of the desert away from his family, but would not dare return home. During our meeting, he was scared of being fired for talking to a journalist. A year ago, he had been sipping tea under a tree in his village with his wife. Now, he was eating stale chicken every day. He found the treatment meted out to him insulting. One of his jobs, he said, involved checking electrical connections in a small space between the ceiling and the roof of a metro station, 30 feet below the ground. “How would you feel if you had to do that?” He agreed that working was hard in India too, but at least it had greenery, festivals and family. He said his attitude might change if his bosses stopped cutting corners, occasionally gave him a raise, or if there were labour inspectors he could trust. Perhaps that might not be enough, either, for he had other grievances. Why, for instance, was his wife not allowed to stay with him? Why could they not live among the locals? Just because their camp now had a patch of grass and concrete housing, rather than the modular cabins made of aluminium sheeting of the past, did that really constitute a good life? 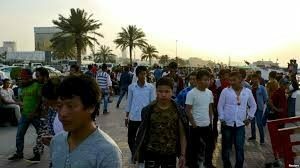 These indignities were enabled by Qatar’s kafala system, a sponsorship visa regime prevalent in many Arab states under which workers cannot leave the country or even give up their jobs without their sponsor’s permission. This allowed employers to get away with oppressive working conditions. Many observers have termed kafala a form of modern slavery. In response to international criticism, the House of Thani, which rules Qatar, announced a slew of reforms, from limiting working hours to loosening kafala conditions. 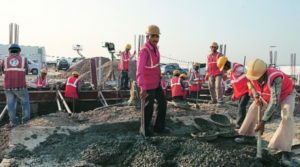 It brought in the ILO to help devise new labour codes. Nicholas McGeehan, a former Human Rights Watch investigator who still takes a keen interest in the country, told me this was just for show. “Since the ILO’s mandate is for three years, Qatar may just be buying time to host the games and then revert to old conduct.” Houtan Homayounpour, the ILO representative in Qatar, was cautious in his assessment, saying that he trusts changes are imminent but that it was still too early to judge the progress of the reforms. In the hot summer month of July, Doha was bereft of native Qataris, most of whom were away on holiday. It was Friday evening, and middle-class South Asian office workers were letting off steam, listening to Bollywood music on the boardwalk or taking rides out into the harbour on replicas of dhows and fishing boats made for tourists. At one corner, a young man from Rajasthan was preparing a pouch of namkeen. Taxi drivers were navigating the city streets, bobbing their heads to the beats of Qatar’s two dedicated subcontinental radio channels. ALSO READ: Why Are Women Without Children Still Stigmatized By Society? South Asians comprise a majority of Qatar’s residents. Over the decades, they have built the country and ensured it runs on time. They have also established social networks to make the city more liveable. Friday-evening leisure, however, is a privilege reserved for the white-collar and lower-middle-class residents of Doha. Ansari and Khan have never had the money to venture this far to relax. Abdul Wahhab, a young taxi driver from Dhaka, was loitering about, gazing at the skyscrapers as the sun set. He told me he wants to run his own taxi service. The changes being introduced in Qatar made him believe that he might be able to realise his dreams. “If my employer doesn’t give me my exit visa,” he told me, “I’ll take him to the labour court.” Armed with the internet on his phone, he was gearing up for a legal fight. Before 2016, if employees were unhappy with their jobs, their only recourse was to return home for a minimum of two years. 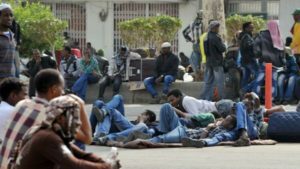 Following the reforms to the kafala system that year, they could apply for an exit visa and come back the next day with a new sponsor, as long as they had their previous employers’ permission—which could be hard to come by. Wahhab had gathered the necessary paperwork and prepared a strategy for how to challenge his employer: he would first approach the exit-permit office, and if his boss stood in his way, he would appeal to the labour court. “If the Qatari is trying to play me, I am going to play him,” Wahhab said with a grin. He could afford to do so because he had saved enough money to tide over a period of withheld wages. However, for the labourers who owe large sums to agents back home, this is still an impossible choice. Previous articleHow ‘Bauxite Mining’ Has Affected ‘Tribals And Adivasis’ In East Godavari District Of Andhra Pradesh?